Abstract. Extreme precipitation is thought to increase with warming at rates similar to or greater than the water vapour holding capacity of the air at ~ 7% °C−1, the so-called Clausius–Clapeyron (CC) rate. We present an empirical study of the variability in the rates of increase in precipitation intensity with air temperature using 30 years of 10 min and 1 h data from 59 stations in Switzerland. The analysis is conducted on storm events rather than fixed interval data, and divided into storm type subsets based on the presence of lightning which is expected to indicate convection. The average rates of increase in extremes (95th percentile) of mean event intensity computed from 10 min data are 6.5% °C−1 (no-lightning events), 8.9% °C−1 (lightning events) and 10.7% °C−1 (all events combined). For peak 10 min intensities during an event the rates are 6.9% °C−1 (no-lightning events), 9.3% °C−1 (lightning events) and 13.0% °C−1 (all events combined). Mixing of the two storm types exaggerates the relations to air temperature. Doubled CC rates reported by other studies are an exception in our data set, even in convective rain. 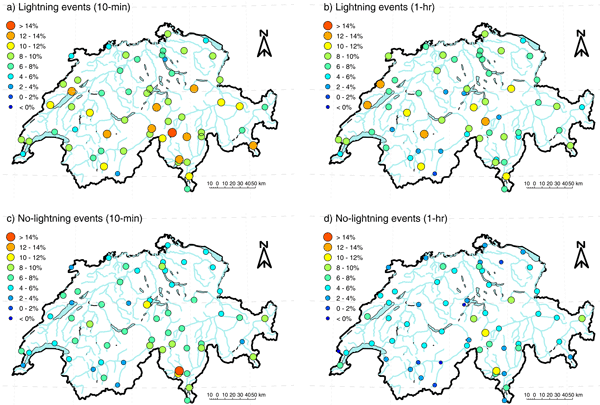 The large spatial variability in scaling rates across Switzerland suggests that both local (orographic) and regional effects limit moisture supply and availability in Alpine environments, especially in mountain valleys. 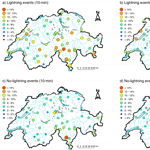 The estimated number of convective events has increased across Switzerland in the last 30 years, with 30% of the stations showing statistically significant changes. The changes in intense convective storms with higher temperatures may be relevant for hydrological risk connected with those events in the future. How to cite: Molnar, P., Fatichi, S., Gaál, L., Szolgay, J., and Burlando, P.: Storm type effects on super Clausius–Clapeyron scaling of intense rainstorm properties with air temperature, Hydrol. Earth Syst. Sci., 19, 1753-1766, https://doi.org/10.5194/hess-19-1753-2015, 2015. We present an empirical study of the rates of increase in precipitation intensity with air temperature using high-resolution 10 min precipitation records in Switzerland. We estimated the scaling rates for lightning (convective) and non-lightning event subsets and show that scaling rates are between 7 and 14%/C for convective rain and that mixing of storm types exaggerates the relations to air temperature. Doubled CC rates reported by other studies are an exception in our data set.